Nurtured by a Communist regime in the mid-20th century, the Czech art glass movement continues to astound the world in the 21st. Ivan Mares, Fan, 2013, glass,34 1⁄4 x 59 7/8 x 7 7/8 in. 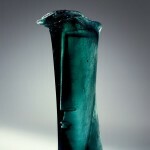 Ivana Sramkova, Introvert, 2011, cast glass, 74 3⁄4 x 21 5/8 x 7 7/8 in. Stanislav Libensky & Jaroslava Brychtova, Head I, 1958. Head I is now part of the Corning’s collection, and it brings visitors to an awed halt day in and day out. 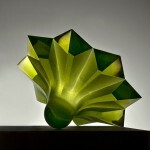 That’s to be expected; midcentury and contemporary Czech art glass tends to have that effect on people. The otherworldly shipment arrived in upstate New York when glass art was having a moment worldwide, and the pieces from Czechoslovakia added fuel to an already lively fire. The area now called the Czech Republic has been a glassmaking center for ages; it’s estimated that around 20 glassworks might have been active there during the late 14th century, and its glittering, prismatic chandeliers were all the rage in the 18th century, gracing Versailles and other noble haunts. But the postwar flowering of Czech glass art, led by René Roubícek, Václav Cigler, František Vízner, and Libenský and Brychtová, was something else entirely. Installations of Czech glass at international expositions such as the 11th Milan Triennial in 1957, the Exposition Universelle in Brussels in 1958, the 1965 São Paulo Biennal, and the 1967 Expo in Montreal dazzled patrons and inspired a rising group of American studio glass artists that included Dale Chihuly. “They took glass from a craft and functionally turned it into what we consider art,” says Corey Hampson, a partner at Habatat Galleries in Royal Oak, Mich., referring in particular to Libenský and Brychtová. “They showed that anything was possible—they could do anything with the material they wanted. They weren’t scared of scale; they weren’t scared of size. To make a major statement, you had to make major work. 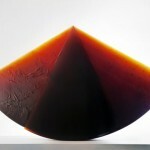 That’s what they did.” Size and scale deserve extra discussion here; some of Libenský and Brychtová’s cast-glass sculptures assumed sizes that were rarely or never seen before in the artistic history of the medium. The 1959 Moscow show at which Head I debuted also included a work of theirs, Fire and Glass, which measured more than 13 feet in length. 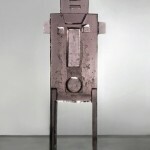 His dozens of graduates include Latchezar Boyadjiev, a Bulgarian-born artist now living in California who creates powerful abstracts; Ivana Sramkova, whose charming but never cloying figurative works often appear in impressively large sizes; and Jan Exnar, who makes compelling sculptures in deceptively simple shapes. But perhaps Libenský’s most successful student with an American presence is Vladimira Klumpar, whose work is in the Corning and who is represented by the Habatat and Heller Galleries, as well as Schantz Galleries in Stockbridge, Mass., and Austin Art Projects of Palm Desert, Calif., which recently hosted its first solo show of her work, “Searching For Light,” which ran from March 22–April 22. 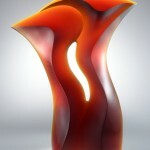 Martin Rosol, another Czech-born-and-trained glass artist represented by Schantz Galleries, pursues an equally labor-intensive path. Trained at a technical school in Prague (but not by Libenský), he was introduced to owner Jim Schantz through Michael Pavlik, Klumpar’s ex-husband and a former glass artist. Rosol has since become a naturalized U.S. citizen and settled in Massachusetts. “Occasionally he casts his own glass, or he gets colored glass that is cast in the Czech Republic, brings it to the U.S., and works with that,” says Schantz. Voyage (2014), testifies to his skill—it’s two pieces of glass of the same grass-green shade, joined to create the whole. “It takes a great deal of expertise to get those two forms so perfectly aligned, and to look as if they’re perfectly aligned,” says Schantz. A single Rosol represents up to 100 hours of concentrated toil. 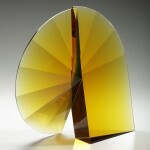 Both Klumpar and Rosol prefer to create unique pieces, which might point to a complicating factor in the Czech glass market. The works are gorgeous and riveting, but they are not, and in truth cannot, be produced as abundantly as other types of art glass. A main reason why so much Czech glass art is monochromatic is the technical difficulty of including more than one color. “The color is always a surprise,” says Klumpar. “I can predict a general outcome, but sometimes something happens in the kiln and the outcome is completely different, with colors changing or disappearing, and I have to start all over—or it looks unexpectedly great. That is why some glass artists do not vary their colors. It always takes time to understand how each color works.” Many artists forestall the question by masterfully exploring the subtleties of their chosen hue, which they accomplish through varying the thickness of the glass. Libenský and Brychtová stepped up and shone when the world was especially hungry for innovative glass art, and Libenský’s influence on Czech glass art cannot be understated. But it’s possible that the style of work that he and his wife were known for might go into decline. But other approaches have emerged in recent years. Hampson’s gallery represents one of the most exciting talents to come out of the Czech Republic in recent years, Martin Janecky. Too young to have learned from Libenský, he embarked on his education at 13 at a glass-blowing school in the Czech town of Nový Bor and was a fully fledged professional by 20. Hampson will never forget his first encounter with Janecky. He was at a Glass Art Society conference in 2009 in Pittsburgh and heard cheers coming from a conference room, a rare occurrence. Intrigued, he went in and saw “a kid, real young, working the hot glass from the inside out. 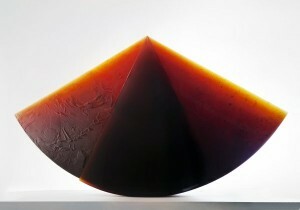 Nobody had ever seen it before.” Hampson says Janecky favors this challenging technique, in which he manipulates the molten glass from the inside, pushing out noses and pinching eyes into being, because it leaves no tool marks on the finished piece. “A lot of people don’t even attempt it, but he can do it,” says Hampson. “I don’t think any other artist can work the way he works. He’s unbelievably talented.” Hampson proudly notes that his gallery has sold 160 Janeckys since 2010.